Subscribe to comments with RSS or TrackBack to 'Divisional Series Pitching Matchups & Predictions'. Once again, I agree pretty much across the board. Much as I hate the Cardinals (aka the Yankees of the NL) I’ll be grudgingly rooting for them to knock the Dodgers off again like they did last year, both because I think they are a weaker team this year than in 2012 and I’d like to see the Nats have their chance at revenge. The O’s are also about to come face-to-face with the old adage that pitching wins championships. The Nats are better in four of the five match-ups, and Fister at his best can beat Bumgarner, who isn’t Kershaw by any stretch of the imagination. The Nats are also better 1-8. So it really comes down to the mental side, mostly in the head (or wherever Hudson said it is – thanks for that little extra incentive, Timmy!). 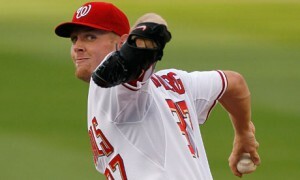 The Nats SHOULD take both the games in DC, not be favored against Bum, but have Gio pitching to close things out. He’s a front-runner, so that would be a good spot for him. My concern would be if the script is flipped, with the Nats down 2-1. I’d start Roark with them facing elimination, but that’s probably not going to happen. My hope would be that the Nats dominate and sweep so it doesn’t become an issue. The more hope the Nats give the Giants, the more they will keep the underdog in it. Without Wacha, StL doesn’t have the upper hand in any pitching match-up until game 4. The Dodgers could sweep. But it’s a similar situation as with the Nats. If the Dodgers let the Cards hang around, the Cards’ postseason juju might kick in, and Mattingly might make a mistake or three, and . . . they’ve still got Kershaw for game 5. And I don’t see the Cards stealing all three they need before game 5. But it sure would be nice for the Nats’ sake to have Kershaw (or Wainright) extended to that 5th game start. Playoff roster is posted. Blevins and Soriano are in; Det is out. Whether Soriano actually gets any meaningful time will remain to be seen. I guess there could have been an argument for Treinen (or Det) over him. Blevins is a little surprising, but he was better than Det over the last couple of weeks. On the bench, they apparently decided that Zimmerman made Hairston redundant, which is true. So who had Kershaw giving up seven, Wainright six, and Peavy semi-dominating with 91 mph junk? Oh well, here’s hoping the warranty on Hudson is finally up. Playoff reactions so far: wow. Just an unbelievable set of games. Playoff roster: definitely surprised Blevins made it over Det. Otherwise no real shockers.